Recent release “A Walk with Death and Doctors” from Page Publishing author Don Baldwin is a chronological account of the cardiac episodes including Doctor’s ego and mistakes and lies that forced the writer to confront his own mortality and decide how to live his life to the fullest for as long as he could. Don Baldwin has completed his new book “A Walk with Death and Doctors”: a candid reflection on a complex death defying medical history. Baldwin shares, "It talks about getting to know one’s disease and understanding it. Learning the foreign language of Doctors so that one can understand what they are saying and then being able to challenge them. To always get a second and even a third opinion. To have the courage to walk away from a Doctor who is not willing to talk and explain things. Finally, it shows that Doctors and hospitals in some states are given basically a free pass for being incompetent. In the state of Indiana, doctors and hospitals have no accountability for their actions or lack thereof. As a transplant survivor, I have endured much pain and numerous problems including vascular rejection." Published by New York City-based Page Publishing, Don Baldwin’s cautionary tale is a thought provoking reflection on life, mortality, and the choices one makes to fulfill their life. Accepting death should not be a fear ridden experience but recognizing what is inevitable without fear. 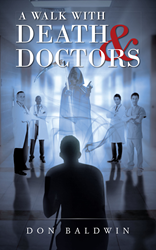 Readers who wish to experience this inspiring work can purchase“A Walk with Death and Doctors” at bookstores everywhere, or online at the Apple iTunes store, Amazon, Google Play or Barnes and Noble.